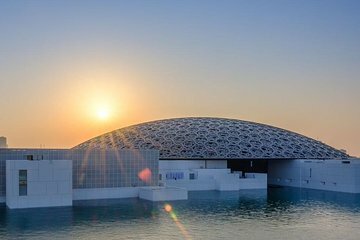 Visit the Louvre Abu Dhabi, the Middle East outpost of France’s iconic art museum. After pickup at your Dubai hotel, drive to Abu Dhabi to explore the museum at your leisure. Stunning architecture featuring a dome of interlocking latticework is complemented by the building’s location on its own man-made marina. We booked this tour with Viator, because of our confidence and earlier very good experioences. This tour however was so bad organised. They picked us up at the hotel but the driver didn't even know the way to the Louvre. We arrived quite late, and when I asked for the (already payed) tickets for entry, the driver didn't know what to do. He wanted to contact his boss , but didn't have any crdit on his telephone. So I had to call what is quite expensive in Abu Dhabi, as you all know. The result was that he had to queue in line to get tickets, he had to pay for in our place. So "skip the line " wasn't for us, we had to wait and wait. Finally at 11 h we got the tickets. Then the driver said he wanted to wait 45 min for us to visit the museum. So we had to be at 11.45 h back at the car. Of course, I didn't agree . After discussing , he gave us until 13 h, Even that was a rush for us, through the museum. We booked this tour and were extremely excited for it. The driver was on time and everything seemed to be going fine, until he asked if we were going to pay for entry to the museum. I responded that the tickets were included in the price of our 5 hour tour. The driver called his boss to confirm despite the fact that I showed him confirmation paperwork that clearly had this information. The driver mentioned that he had another excursion planned for later in the day. I didn't think anything of this at the time. Cut to an hour later when we arrived at the Louvre and he purchased the tickets he then asks us to be back in the car in 80 minutes because he had another excursion to get to that afternoon. I begged for an extra 20 minutes, which he never actually agreed to. Again, remember, this was supposed to be a 5 hour tour, with an hour drive each way, we should have had at least 2.5 hours at the museum. We rushed through the museum, got outside and were going to take pictures but our driver was already waiting and took 3 pictures of us before rushing us back to the car. Again, he mentioned the other excursion later that afternoon. We were back at our hotel exactly 4 hours after we left and could barely remember anything we saw because there was no time to register anything. I issued a complaint to Viator who looked into my complaint by contacting the company directly, they outright lied about what happened. No surprise there, why would they admit to not giving what was paid for? Warning to the wise, don't book with RAH.